Who are the best RI athletes that will be competing at the New Balance Nationals Indoor (NBNI) Championships, March 11-13? Leading up to the nationals at the New Balance Armory in New York City, MileSplit RI will feature what we consider the top athletes from the Ocean State in their respective events. Championship: Girls, Sunday, 4:30 p.m.; Boys, Sunday, 12 p.m. 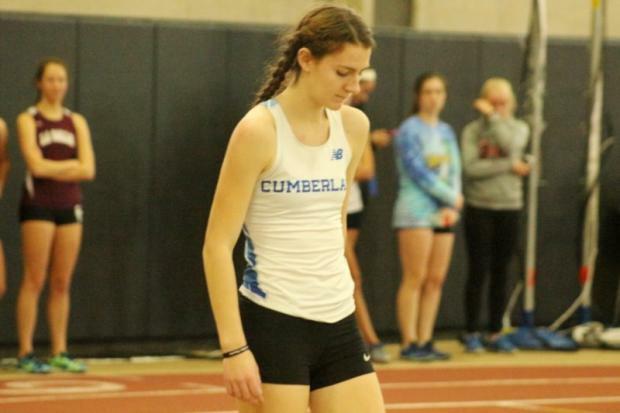 The Ocean State will be represented by two long-jumpers at the Nationals, a pair of leapers that have potential for some PR performances inside The Armory this weekend - South Kingstown's Anthony Shepard and Cumberland's Meaghan Scullin. In the boys' competition, the Rebels' Shepard will be in a field that features five athletes that have gone further than 24 feet, including top-seed Rayvin Grey of Beacon (NY), who ranks No. 2 in the country with a best of 24-11.5. A handful more have done better than 23 feet. Shepard, a two-time state champion and the recent New England titlist, goes into the meet with an impressive 22-11 best from early January. He was 22-0.5 at the New England's.In 2015, a distance of 22 feet would place you in the top nine. With the field this year, that might not be the case. Shepard has been consistent all season with just one jump under 22 feet, his winning 21-11.5 distance at the States. If he can match his near 23-footer from two months ago, Shepard may have a chance at finishing among the 10 best. Scullin, a three-time state champion, goes into this weekend's meet with a PB of 18-6, which she did at the divisional championships in late January. After winning state title No. 3 on Feb. 20, Scullin didn't have her best performance at the New England meet, finishing fifth with a leap of 17-3.5. But she's capable of matching or exceeding her best against the level of competition she'll face on Sunday. To place in the top 10-15, that's what Scullin will have to do.